With as much rain and cloudy days we have had this winter, solar energy should be the farthest thing from my mind. 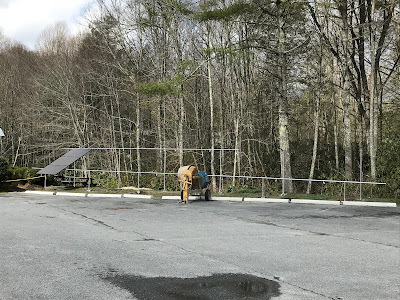 However, I feel quite certain that the sun will come out again, which is why Eagle Solar is currently installing a solar energy system for our maintenance facility. All the panels arrived on 4 pallets. This past summer, Sam Yates of Eagle Solar proposed adding a solar energy system to the clubhouse. For various reasons, it was determined that the clubhouse was not a good candidate for the system. However, I asked Sam if our maintenance facility would be a good candidate since it is for the most part out of sight and more importantly, out in the open. Each panel must be mapped. Roof rails that will hold the panels. Sam proceeded with a study which included years of past electricity use, satellite imagery of our facility, an engineering study of our building, along with the estimated savings in electrical costs. His proposal estimated our savings in electrical costs would be greater than the planned lease costs of the system. Last fall, we elected to go ahead with Eagle Solar's bid. However, based on his study and proposal, only a portion of our building was structurally strong enough to accommodate the solar panels. As a result, we would have to locate some of the panels in an area adjacent to the staff parking lot. Unfinished array adjacent to the parking lot. One of the major benefits of Eagle Solar's proposal to the club was that it would not cost the club anything. Eagle Solar would provide the installation and would get all the necessary permits. After 10 years, the lease payment goes away and the club would own the system. Even when the lease payment is factored in, the club will save over $1000 per year in electrical costs. Other benefits include, very low maintenance, supporting a "Green" business approach, reduced pollution, and demonstrating HFCC's support to the environment. Each year I am fortunate enough to attend the Golf Industry Show (GIS) which this year was held in San Antonio Texas. The GIS is an annual conference that brings together golf course superintendents, owners, architects, and suppliers from all over the world. The conference features several days of educational seminars followed by the annual trade show. I was able to take advantage of several educational opportunities along with a productive stroll through the trade show. Of the educational opportunities, my favorite was "Bee the Change: Getting Started with Beekeeping on the Golf Course". This was a great class that provided an overview of honey bee biology, colony life, basic entomology, golf course considerations, improving foraging area, and overall hive management. Judging by the attendance, there are a lot of golf courses other than ourselves that are working hard to make a major impact on improving the environment for pollinators. Discussing the location of bee hives on the golf course. The trade show floor is the place where companies can show off their latest creations and hopefully announce major deals. With our G&G chairman, John Eastman present, we announced our own major deal with Hunter Golf and Simmons Irrigation. Early this spring, we will be replacing our old irrigation computer and controllers with Hunter's new Pilot system. Our old controllers are no longer supported and parts are getting more difficult to source. Hunter's new system is the most robust and efficient system in the industry today and will serve HFCC for many years to come. Kevin Johnson of Hunter Golf announces that HFCC will be the latest course to install Hunter's Pilot irrigation system. I would like to thank all the members of HFCC for allowing me to continue to pursue my professional development by attending the annual Golf Industry Show. The amount of information that I learn through the education, networking with my peers, and attending the trade show is immeasurable. I have consistently been able to bring back useful information that has benefited the Club in both savings and efficiency, not to mention the agronomic knowledge that benefits the course. One of the main projects for this winter has been tree removal and trimming back underbrush and rhododendrons. While I have detailed the trimming and removal in past posts, I have not adequately detailed the scope of the project that we have undertaken. Over the years a significant amount of trees have encroached on the playing area. Some of these trees started out as volunteers and some have been there for years. However, the nature of the tree removal has been to remove trees that are either decayed and dying or because they inhibit turf growth due to excessive shade. By the time we are done, we will have removed about 100 large trees, primarily on the front nine. Some of the tree removal has required the service of professional arborists. Felling 100 large trees is in itself a major project for our staff, but the work doesn't stop once the trees are down. After the trees are down, they are cut up and the branches sent through the chipper. If it is a hardwood, we cut the wood and split it into firewood where we use it to heat the maintenance facility. If it is a softwood then we chip what we can and the rest is hauled off to the dump. Split firewood for heating the maintenance building and material being readied to be hauled away. Once the tree is removed we are left with the stump. If the stump is off in the woods, then we cut it flush and leave it. If it is within the turf, then we remove the stump. Generally, a large hole needs to be dug to get the stump loose so that it can be removed. The resulting hole is filled in with dirt and sod is installed. The stump is then hauled away to the dump. Some of the larger stumps can take nearly a day to remove. Leaving the stump is not an option (even if we grind it down) as the decaying wood makes growing grass difficult and eventually causes a hole to form. Roots being pruned from a large oak stump. A large hole needs to be dug to remove the stump. This has been a major undertaking for our staff but one that will reap benefits far into the future. Those that have seen our work have been excited about what they see. Getting the course ready for the upcoming season does not just include working on the course, but also planning for some of the smaller details that tend to get taken for granted. One of those small details is ball washers. Lee Howell from Corbin Turf just delivered all new ball washers for the course. Our old washers were just to a point where fixing and repainting them no longer made fiscal sense. However, we did get our monies worth as the old washers were on the course for approximately 30 years! Since we had such good experience with the previous washers, we chose to get the same brand and style again. Lee Howell of Corbin Turf with Asst. Supt Chris Cowan delivering new ball washers. With a desire to have our course accessories blend more into the environment, the Greens & Grounds committee chose to have the washers painted in brown instead of the standard green. I've had a good look at them and they will look great on the course.